Can I limit the emergency access to only one password? Yes. There are two slightly different ways to use the emergency feature: you can either have your emergency contact be able to request full access to all your passwords and secure notes, for instance for a close friend or a member of your family in case of emergency, or you can limit the emergency access to a list of passwords and secure notes that you choose, which can be more suited for work relationships. To do this, go to the Emergency section of your Dashlane application and click on Add new. 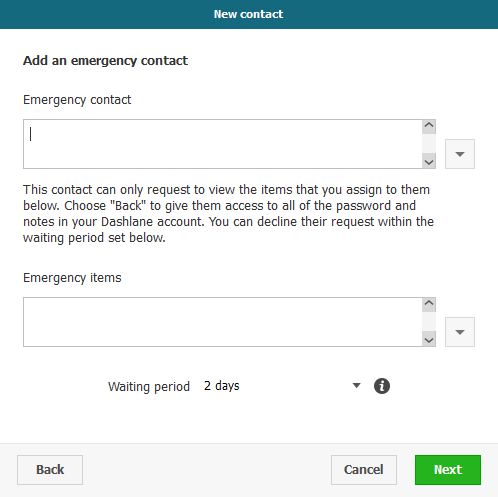 After that, you will be prompted to add the email addresses of your emergency contacts and to choose the waiting period. You will notice an Advanced button in the bottom left-hand corner. When you click on it, you will be able to choose a list of the items you want to be included in the emergency access. You can select any number of items. 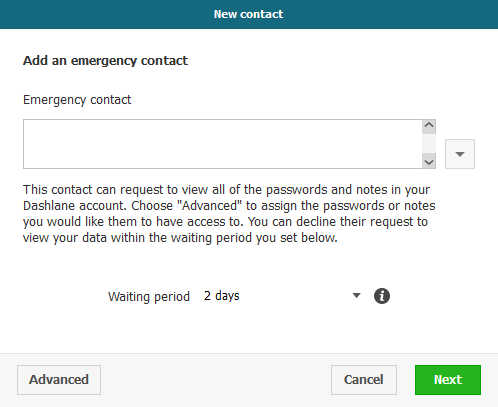 If you click on Back or if you never click on Advanced, all your items will be included emergency access, which means that if your emergency contact's request to view your data is accepted, they will have a read-only access to all your passwords and secure notes.